Having watched Romanian director Christi Pulu’s latest film last week (Aurora), I thought I’d give his earlier (2010) film a look. It has the sane almost documentary feel and style (‘real-time’) but while long at two and a half hours, it keeps its excess under the three-hour mark. That’s a good thing. The Death of Mr. Lazarescu has more to work with in a script that is an indictment of the Romanian system of health care. An elderly man who lives alone is not feeling well and makes a few calls for medical assistance before being aided by his neighbors who finally get them to show up have hin seen at the emergency room. This is only the first step is a long night of being caught in the increasingly frustrating medical system of Romania. 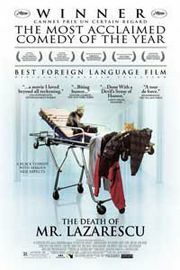 As the patient is shuffled from one emergency room to another, the patient slides further and further towards his death. It’s a night you wouldn’t want to experience. Ever. There’s some good acting here as well. The actress (Sandu Sterian) who portrays the EMT who initially picks him up and hangs with him the entire time (even though she takes her fair share of cause from the system (mostly doctors and ER nurses) is very good, showing an unflappale sense of the way things are. You get the feeling that she has seen this all before – and maybe worse. There is an ER nurse at the last hospital he is taken to (a minor part) that struck me because of the utter exhaustion written all over her face and body. A cut above his latest, I thought. I miss Charlie. Are any other friends checking in here to remind themselves of his voice?